GENERAC has over fifty years of experience producing residential generators. They are known for reliable and durable units that require very little maintenance. Their extensive line of generators feature quiet operation, reduced emissions and is extremely eco-friendly. Residential generators are completely automatic. Within seconds of a power interruption, the GENERAC will come alive and seamlessly supply electricity to either the entire home or to critical circuits. When you are home or away, GENERAC offers power when you need it. GENERAC air cooled generators are fueled by LP or natural gas. They have a smaller carbon footprint with reduced air quality emission levels. 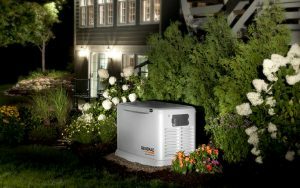 By applying the latest in technology, GENERAC has created a line of gas generators unsurpassed in reliability and longevity. GENERAC’s decades of experience goes into their alternators, which are optimized for outstanding performance. These are machine wound and inserted and varnished for the ultimate in consistency. Vented rotors contribute to cooler operation, a longer life and enhanced efficiency. From the GENERAC 10Kw generator to their largest industrial 1250Kw unit, their entire line comes equipped with the PowerManager digital control system. GENERAC puts in the highest level of reliability and with the PowerManager system. It allows you to actually see the outstanding performance every GENERAC generator is known for. GENERAC manufactures its own generator enclosures, utilizing the latest engineering advances in noise reduction. They are weather resistant, streamlined in design and attain the highest level of durability. A heavy-duty base frame ensures an accurate alignment between the engine and the alternator at all times. Vibration isolators contribute to every unit’s smooth operation. Oil and water drain points are situated for easy access making maintenance routines simple.